Do you remember shooting with film? Most people who handled a camera before around 1998 will recall having to choose from a huge variety of black & white or color films. Back then, you had to have a fairly discerning vision about your final pictures because films and slides had distinctive characteristic effects, such as Kodak’s Kodachrome’s vivid colors or TRI-X’s moody, grainy monochrome. Today’s digital cameras offer color palettes, rarely giving a recognizable look or personality. The key differentiator now is software. Installed apps on the desktop, plug-ins to host applications and mobile apps, essentially take the place of film stocks. That should make choosing a film style easier, right? No way. That’s because when you bought film at the drugstore or your local camera shop, there was plenty of variety, but not an unlimited supply. 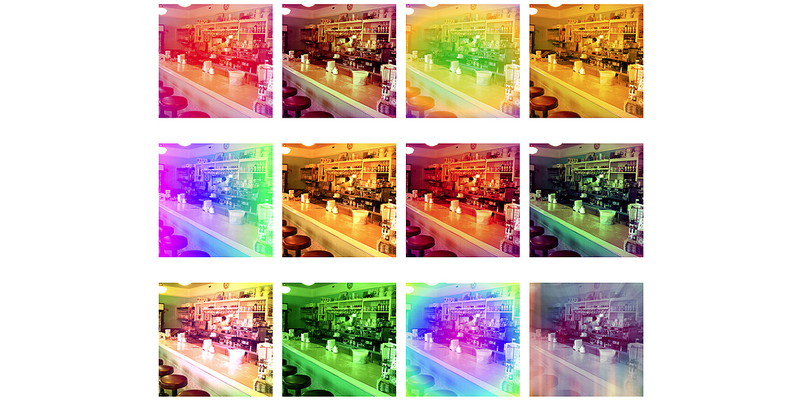 With digital film apps, there literally is an infinite number of film effects you can apply. And it can set your head to spinning. 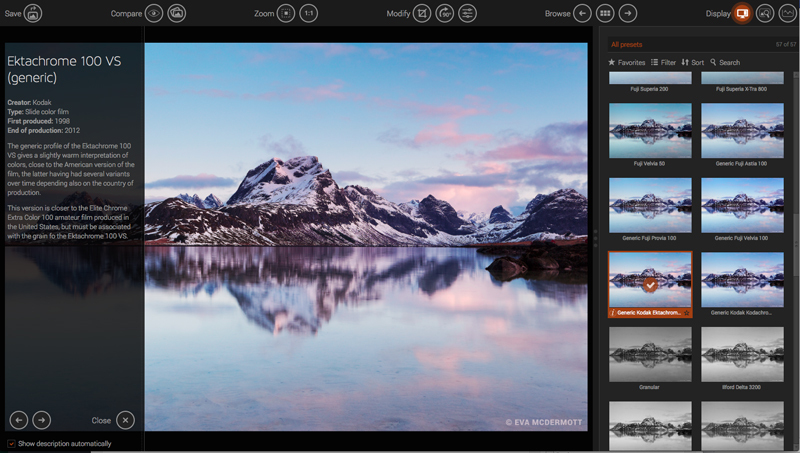 We look at some of the top-notch plug-ins for Mac and PC, some of which also have companion mobile apps, to steer you in the direction of making your images look like you shot them the old-fashioned way. 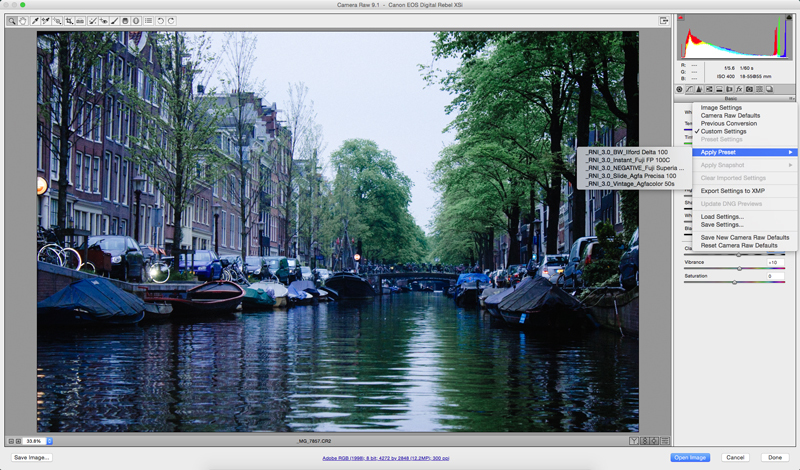 Alien Skin Exposure is a plug-in for Photoshop on both Mac and Windows, as well as a standalone app. Now in its seventh version, Exposure is derived from the look of historical films that hark back to a recognizable past. Alien Skin says it applies scientific analysis to discontinued color and black & white films and darkroom techniques. It even analyzes film grain under a microscope to get the proper characteristic look. With over 470 presets that emulate everything from creative focus effects to the warm look and feel of film, Exposure features classic favorites like Kodachrome, TRI-X, Polaroid, Portra and Neopan, plus obscure selections like Panatomic-X and GAF 500. You can use the app’s presets or create your own unique looks. Tool Tips give you massive amounts of information about each of your choices — sometimes to the point of distraction — but it’s all good. Exposure has always been one of my favorites, and though I tend to use filters sparingly, this is one I always come back to. DxO says its filters are created via a scientific process of film profiling based on real-life and calibrated shots, and that when the sample film is developed, it gets high-resolution digitization to measure and extract the grain matrices. This is designed to reproduce a high-fidelity rendering of the characteristic appearance, colors and grains of 83 historical films — color negatives, black & white, slides and instant snapshots for its FilmPack 5 release. These people are not fooling around. The software includes 16 additional analog film renderings — films that have already or will soon disappear, creative films and black & white renderings. The sampling not only tells you the name of the film, but has a thorough explanation about why it’s an interesting choice. The package is very easy to use: You can start with some basic editing, and then get down to the business of choosing the film you want. Visual Supply Company is all about film, and is one of the more popular retro film packages for both hobbyists and pros. The company offers eight sets of film filter packs. You can begin with the free Starter Pack and then progress to packages like Eclectic, Alternative Process, Archetype, Slide, Instant, Classic and Modern films. There’s nothing to the interface; just click until you see what you like. Each category has at least 10 and often many more varieties of film from Agfa, Kodak, Fuji, Ilford, Polaroid and others to simulate the most popular emulations of analog film, featuring cross processing, mass market consumer emulsions, current and discontinued slide film, present day and discontinued stocks. 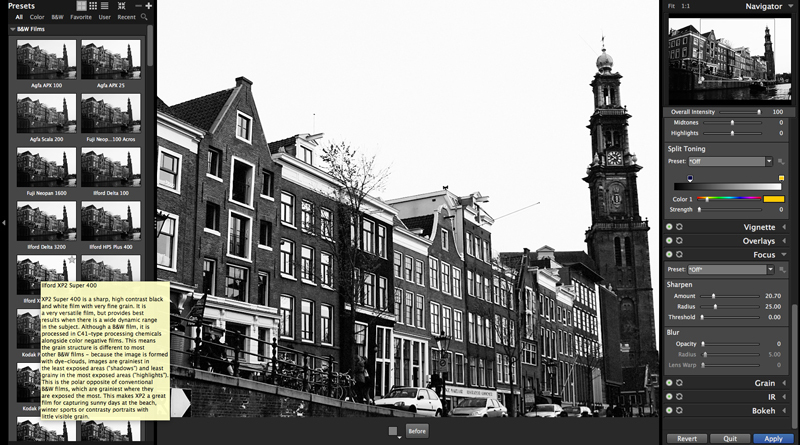 A companion app for iOS and Android called VSCO Cam offers a mobile version of the package. This set is comprised of five film preset packages that were created to precisely simulate the most recognized films of 20th century. Based on long-term work with analog counterparts, RNI All Films simulates the character of analog photography within a digital workflow. 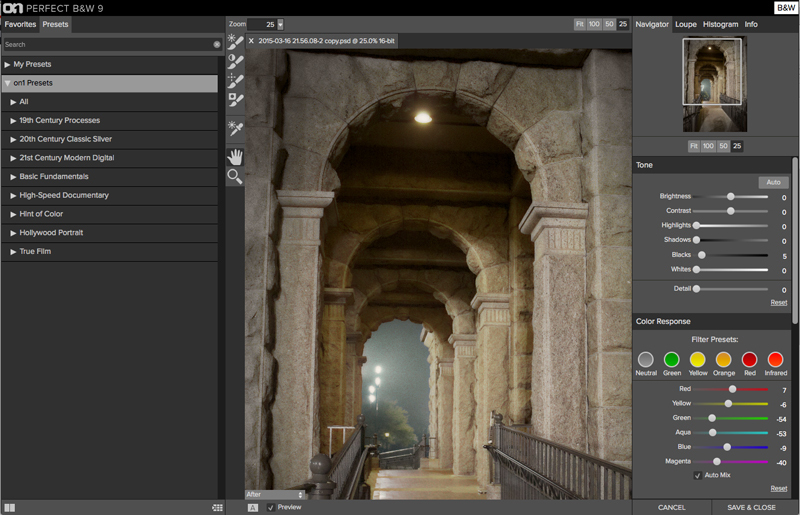 The presets are suggested for use with Raw images, but they also perform well with JPEGs from modern cameras. I suggest you read the manual to get the lowdown on how to install them. 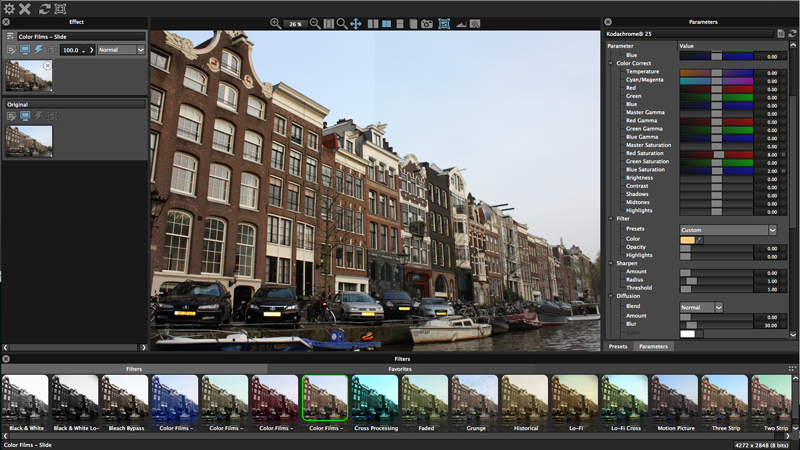 The latest version offers more than 170 new film presets, and all of those from the previous version have been re-worked or fine-tuned for better accuracy for newer cameras. This package also includes an Essentials Toolkit for quick control over contrast, fade, grain, vignette and slide frame effects. There are so many different films in this collection, it almost made my heart stop. 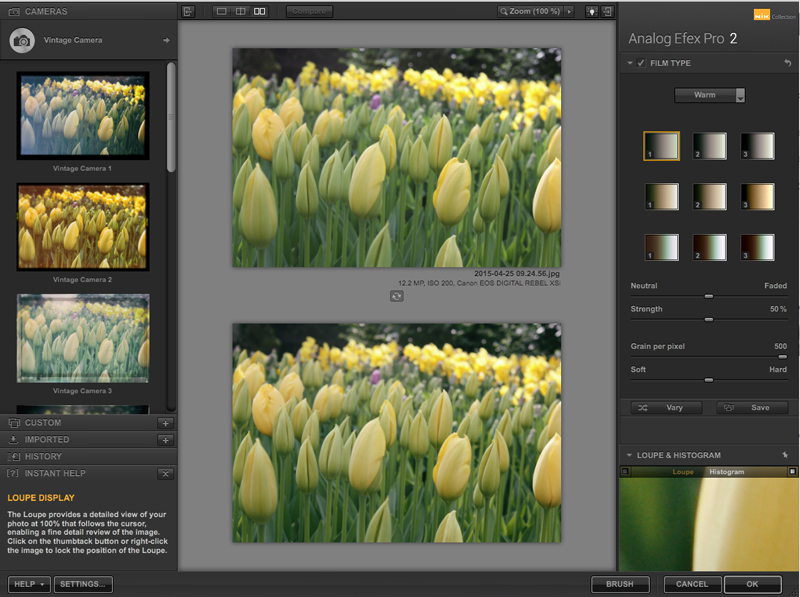 Google’s Nik Analog Efex Pro, inspired by traditional cameras and photo development. 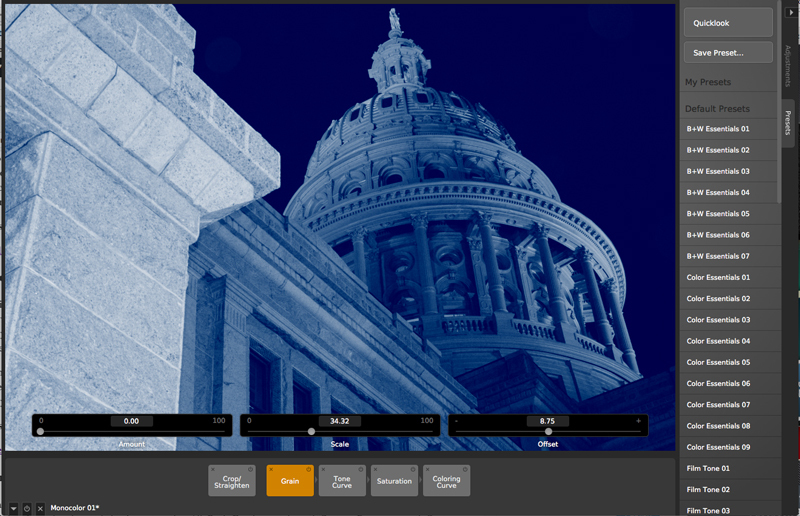 lets you choose from 10 different tool combinations to apply effects. You can also rely on the app’s Camera Kit to mix and match analog features and processing techniques such as Classic Camera, Toy Camera, Vintage Camera, Subtle Cast and others. 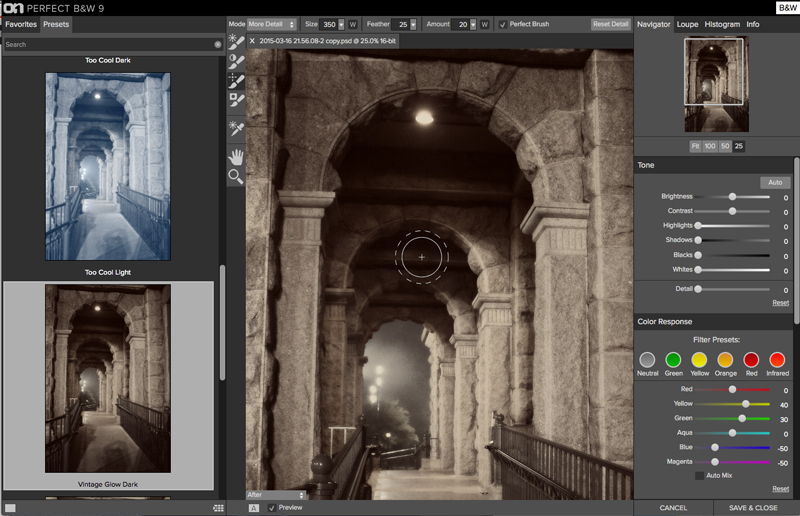 You can create professionally stylized images by selecting a preset and then fine-tuning it to personalize the effect. 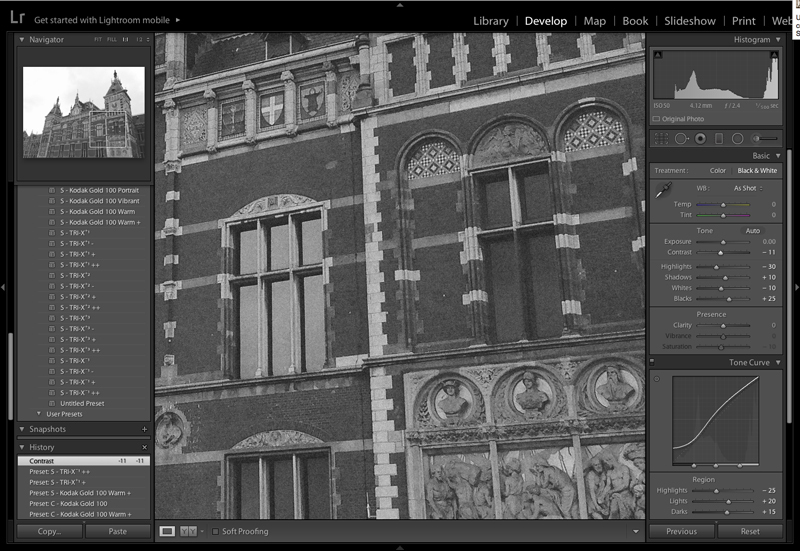 Choose one, two, or even all 14 available tools for controlling and adjusting your images — they sit in a panel on the left while you fine-tune the results on the right. 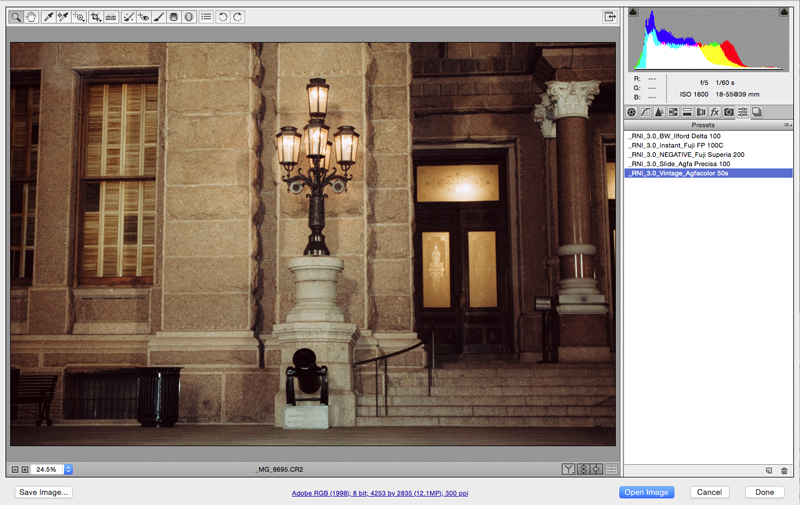 Compare the original and the filtered version in real time. 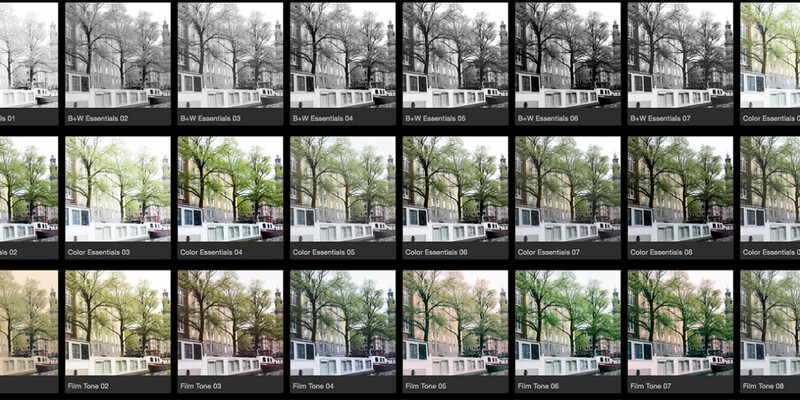 Film Stocks simulates 288 different color and black and white still photographic film stocks, motion picture film stocks and historical photographic processes. The product is based on research and analysis of different films to create analog photographic, motion picture and vintage looks in categories like Color Films Polaroid, Black & White, Lo-fi and Historical. You can select from films like Agfa, Fuji, Ilford, Kodak, Polaroid and Rollei color and black and white film, choosing from a wide range of historical photographic processes including Bleach Bypass, Cross processing and technicolor three-strip and two-strip processes. 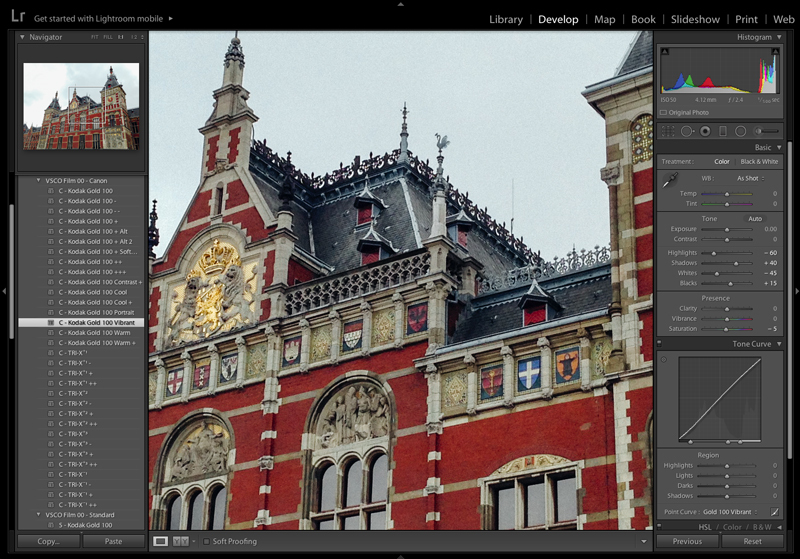 Compare before and with an auto setting and tweak your images with a complete set of sliders. Apply Lo-Fi photographic looks from Lomo and Holga toy cameras and as well as the looks of faded films or grunge effects, or create your own presets. Retrographer offers more than 1,100 preset camera settings to choose from with millions of combinations to give you the authentic vintage camera looks including Lomo, Dianne, Holga, Polaroid, Brownie, Kodak, Daguerreotype and more. The app opens in its own window outside of the host app. From there you can choose from Camera, Lens, Flash, Film, Lab, Effects and Finish. I concentrated on the cameras for this example, but there are plenty of special effects to choose from. 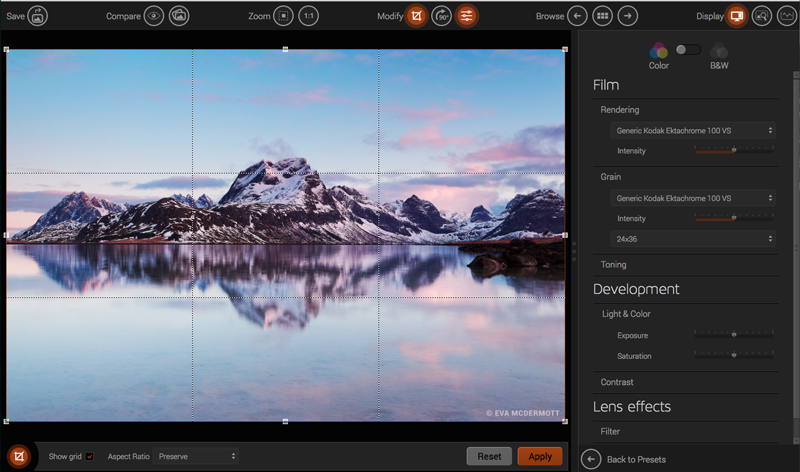 Other interface controls let you interactively set the level of grain, dial in exposure controls like intensity and luminosity, hue and saturation and processing effects on top of the main film category. A large variety of artistic cameras also impart an old-timey look. 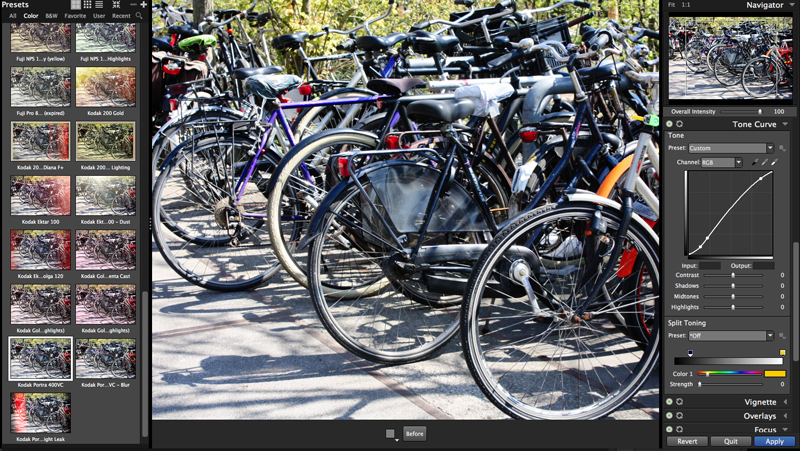 Be sure to check out the auto shutter that will randomly apply looks to your picture. Once you have an image looking the way you want it, you can frame it with a variety of styles including film stock, wet transfer, classic snapshot, slides and decorative frames. 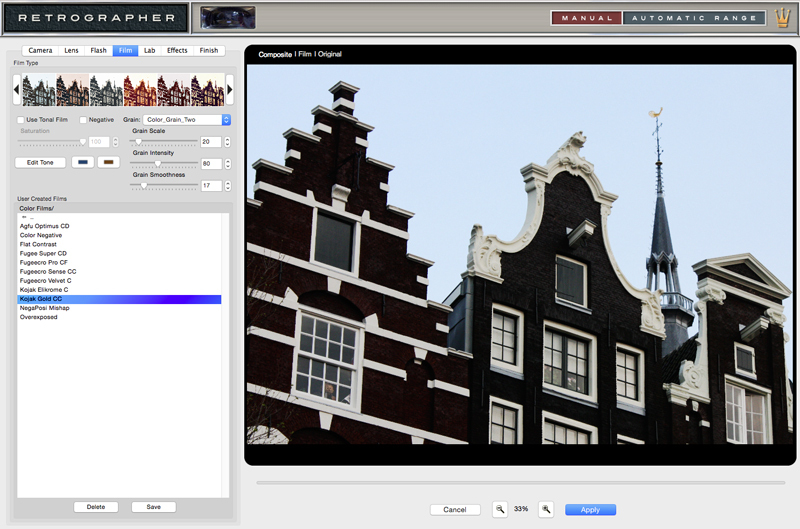 The first thing you want to do upon launching this plug-in is try out your images with the large number of built-in presets, accessed from the left side of the window and sorted into nine categories like All, Basic Fundamentals, 19th Century Processes, 20th Century Classic Silver, 21st Century Modern Digital, High-Speed Documentary, Hint of Color, Hollywood Portrait and True Film. Perfect B&W features 16 simulated film effects in the True Film category including an Ilford Delta, Kodak T-Max and a Fujifilm Neopan, which is plenty to get you started. An assortment of brushes lets you paint on effects to discrete parts of the image, so you can boost the sharpness in one area without affecting everywhere else. 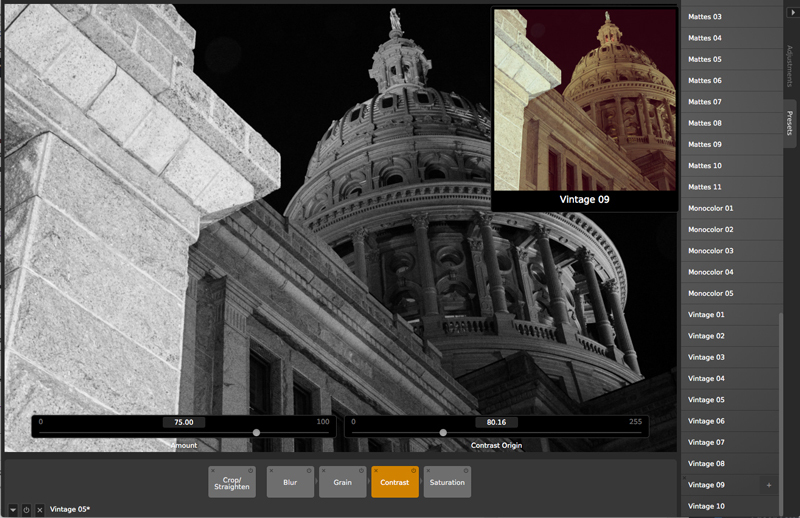 CameraBag is a non-destructive filter that has a dual component. 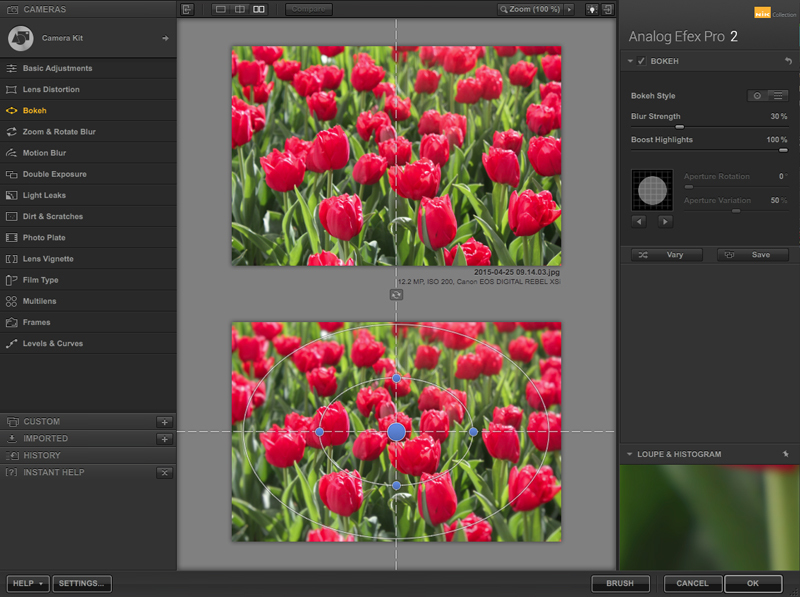 You can use it to do straight edits of your images in preparation for applying filtered effects. As a standalone app, you don’t need to plug it into a host app. It has very smooth performance with an interactive and dynamic workflow — no jerky movements no matter how much you tinker and it works especially well with Raw images. 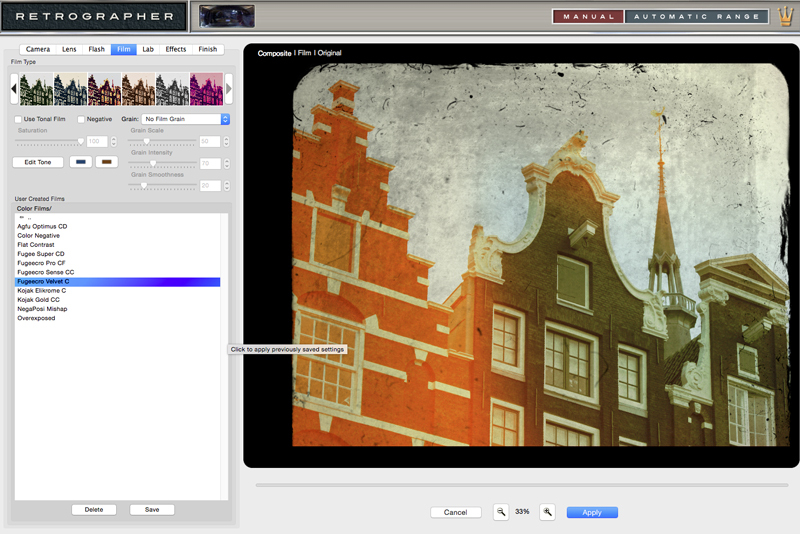 CameraBag’s tile-based workflow is a joy to use because it lets you see the adjustments applied in real time. Each adjustment is labeled so you don’t lose track of what you’re doing — and usually, you’re pretty occupied with an assortment of controls. 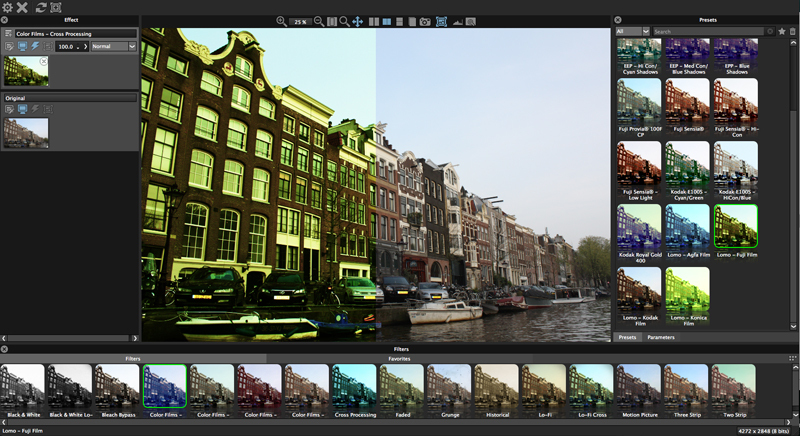 The app makes it easy to tweak, re-order, layer and nest effects. You can do complex work easily like layering multiple tone curves rather than trying to squeeze all levels adjustments into one curve. You can get started with CameraBag’s large number of included presets, but be careful not to lose track of time as you go deeper by creating and sharing your own. A companion app for iOS offers a mobile version of the package. Each one of the above apps can help make your images shine. While their distinctive styles may not be immediately recognizable to the outside world as shot with a particular film, using them will give you a much better idea of how to stylize your favorite scenes. Almost all these packages are cross-platform, almost all have a free trial available, and several have companion mobile apps. Give them a try and let us know in the comments if we missed any of your favorites.